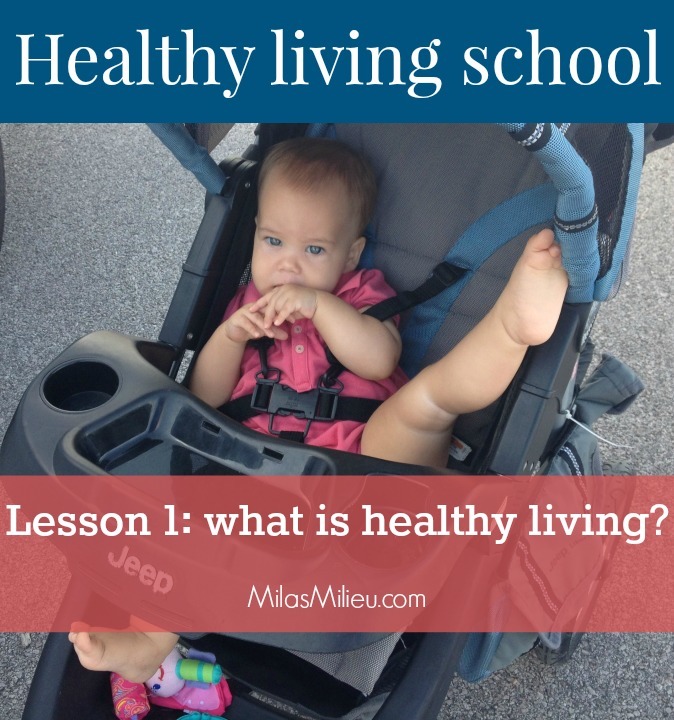 Healthy living school, lesson 1: what is healthy living? If you have been following my blog for a while, you know that I write a lot about exercising and healthy eating. I am not a fitness professional or a nutritionist. I just like to share my personal experience in these areas. I get excited when I discover simple but effective ways to stay fit and eat healthy. I decided to organize all these tips and tidbits into a series of posts called “Healthy living school”. “School” implies learning and teaching. I see myself as your fellow student, learning from various resources, experimenting and documenting results. I would love to hear from you about your experience, so please share your tips in the comments! The first post in the series is about definition of healthy living– you have to start from the basics, right? I never really thought about “healthy living” until about 5 years ago; it was not on my radar. I had not had health issues, so there really seemed to be no need to change the way I ate or change my level of activity. In my eyes, I was as healthy as can be, and pretty content with myself. At that time a lot of changes started happening in my personal life, and I found myself the sole provider for three small children. At the same time I was faced with a possibility of losing my job (it was during the recession of 2008-2009). These circumstances made me realize that I needed to be strong to deal with all the craziness that was coming my way. They also made me realized that I, in fact, was nowhere near a definition of strong. I could barely run half a mile, or do 3 push-ups. At one point I ended up at a hospital with chest pains (turned out to be stress related), where I had to do a treadmill test to make sure there was nothing wrong with my heart. That was the first time I stepped on a treadmill in my life. My heart performed well, but I was so miserable huffing and puffing through the test that the technician monitoring it felt compelled to give me his unsolicited advice: “Wow, you have three kids, you should really get in a better shape”. The rude technician aside, that was a blessing in disguise and put things in perspective for me. A new definition of “healthy living” started to crystallize. I started making changes to my lifestyle bit by bit, and started seeing the results I was happy with. The funny thing is that along the way other aspects of my life started falling into place and I don’t think it is a coincidence. Being fit, energetic, strong and flexible. I want to be able to run around with the kids in the park instead of sitting it out on the bench, to carry loads of laundry up and down the stairs, to load and unload bags of groceries, and climbing on the kitchen counters to reach the top shelf of the cabinets (anyone else do that?). In other words, I want to be active and “present”. “Paying it forward” in terms of long-term health. It’s a well-researched fact that consistent active lifestyle helps prevent a number of conditions once you get older, from osteoporosis to cancer, to diabetes, to Alzheimer’s. Healthy lifestyle is not a panacea for these and other conditions, but it can greatly reduce the risk. So it is a no-brainer for me. Connecting with the basics of simple living in general. I don’t call myself a minimalist, but I do focus on the intentional living. There are a lot of distractions, redundancies and the superficial out there. All that glitters is definitely not all gold. Focusing on healthy living to me includes having a healthy outlook on things that are not necessarily physical. I try to use mostly unprocessed ingredients in my cooking, base our purchases on “needs” instead of “wants”, and I don’t watch much TV. What are your thoughts on healthy living? Do you feel like you are at a perfect place right now, or would you like to make some changes to your life style? Love the new look! Let’s see, to answer your question most days I feel pretty balanced. I’m a balanced person naturally though – mostly good food, a little bad, exercise – not too much, not too little – wine – at most two glasses, diet coke only on vacay – etc. I have a lot of rules I make for myself but don’t feel restricted by any of them. Thanks, Courtney! I like your approach, we are definitely on the same page. Moderation is key. Great thoughts. I look forward to reading more on this. My third is now almost 9 months and I feel ready to get back into the exercise mode for sake of my overall health! It does get easier to find time to exercise when the baby gets older!